I surely do not need to ramble on regarding the tale of Founders Brewing Company, as their brews are pretty well known around beer dork-dom and they remain one of the larger craft brewers in the Midwest (albeit significantly smaller than Bell’s in Michigan). They actually started as the partnership between two friends in Grand Rapids, who—with the assistance of several investors—opened their doors in the mid-’90s after a brief period of contract-brewing their beers from Minnesota—at a warehouse location just north of the slowly revitalizing downtown area. Growth was slow in the beginning, as there were several Michigan startups at the same time competing for local publicity and handle space. The most significant of these was the now-defunct Robert Thomas Brewing Company, also in Grand Rapids, who played chief rival in the early years and who purchased the existing (and underrated) Roffey Brewing Company from Holland, before their demise. Their space is now occupied by Schmohz Brewery. Originally known as Canal Street, the Founders partners were nothing if not flexible and quick studies. The departure of original brewer, Rich Michaels, now with F.X. Matt in New York state, began a period of experimentation … with recipes, brewers (including some contracting for other breweries), and local pub vibe until they slowly found their way with local fans, primarily by pushing the limits of flavors and getting more aggressive with their beers while plugging into a local live music scene and the bustling downtown vibe. The results, by now, are near legendary. They moved into their new, larger location two years ago on the south side of downtown Grand Rapids and have already announced expansion plans. Their Founders Fest is an annual destination for beer and music fans alike and they’ve found a niche with the beer public as their lofty rating on Rate Beer and Beer Advocate would suggest. Perhaps even more telling, in my conversations with industry pros throughout the U.S., Founders is always the Michigan brewer they want to talk about or want to visit when they’re in the neighborhood. At a hefty 11.2 percent ABV and 70 IBU, one expects big flavors, but the layering and complexity of this brew is world class—and probably benefitted from being a few months old. It pours deep and black, with a thin brown, milk-chocolate head that clings to the glass like one of those little rubber wall stickers you had as a kid. The nose is soft, silky, and washes over the tongue and onto the roof of the palate in waves of creamy chocolate and roasted malt. There’s an herbal spiciness with hints of sweet vanilla, earthy tannins, and a lingering dry, malty finish that beckons the next sip. Opening up as it warms, the full mouth feel and alcohol is in perfect balance with the generous hoppy dryness that cleans up the sweetness, without overwhelming it. 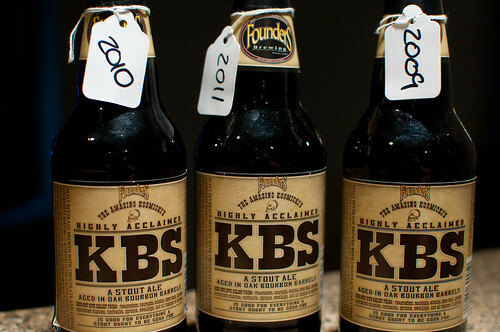 This is one where we can all agree, the KBS and isn’t just for breakfast any more. The first consumer protection law ever written was enacted over beer by Duke Wilhelm IV of Bavaria in 1516, known as the Reinheitsgebot. 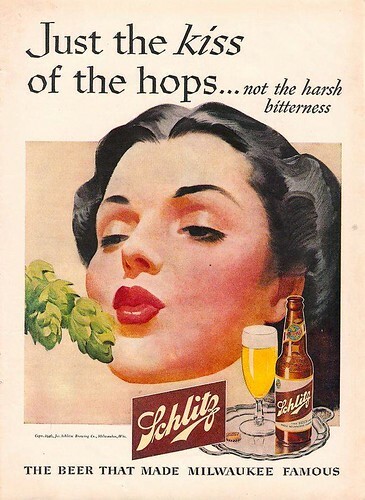 It was a purity law limiting the ingredients of beer to malt, hops and water (and later yeast). Today in 1978, Jimmy Carter signed a bill that made home brewing legal for individuals making up to 200 gallons per year for personal use. Devil’s Peak IPA is supposed to be their “monster” beer offering for the big flavored beer aficionado or, perhaps, Eddie. Unfortunately for them, “big” apparently means “bitter.” Deep orange in color, it has a thin, watery body and very low carbonation. The nose is pungent herbal and, using a selection of domestic bittering hops, it’s very dry and bitter from the initial sip to the long, dry, never-ending finish. There’s almost no balance, as bitterness overwhelms any sense of malt or sweetness. Did I mention it was bitter? Late this summer, I scored a couple of six packs to do a tasting. Lift Bridge Brown is an American Brown Ale, named after the double-decker bridge that connects Houghton and Hancock on the Keweenaw Peninsula, which extends north into Lake Superior. It’s a solid brown in color, with a thinner body than I’d expect, and it was overcarbonated in the can that I poured. There’s a touch of chocolate on the roof of the palate, but with a softer finish and dryness on the sides of the tongue, it reminded me a bit of a Bell’s Amber Ale. The bittering hops were slightly out of balance due to a lack of sweetness, particularly for a brown, although the body opens up a bit as it warms. All and all, it’s not a bad effort.